Is A Smartphone Accurate Enough To Monitor Heart Conditions? : Shots - Health News Smartphones can be used to test for atrial fibrillation, an irregular heart rhythm that can cause strokes. But it's still not clear who should use this emerging technology. Digital gizmos can monitor your heart, whether it's a wrist-worn fitness tracker or a smartphone app to help cardiologists analyze diagnostic tests. The question is whether they're going to do your heart any good. The short answer: It depends. One thing to consider is whether the device is a consumer fitness monitor for tracking heart rate, or if it's a medical device approved by the Food and Drug Administration for detecting potentially dangerous heart rhythm irregularities. First, the fitness monitors. Wrist-worn fitness trackers become less accurate with more vigorous exercise, which presumably is when you'd most want to know your heart rate. The study, published Wednesday in JAMA Cardiology, tested the Apple Watch, Fitbit Charge HR, Basis Peak and Mio Alpha wristbands. "We have patients come in who have different kinds of monitors like these. Many of them are very concerned because they've recorded values that seem way outside of the normal range," says Dr. Marc Gillinov, a cardiac surgeon at the Cleveland Clinic and an author on the study. The study was designed to find out whether those readings are accurate. Overall, the Apple Watch and Mio Fuse did best, with about 91 percent accuracy. The others fell in the 80 percent accuracy range, both overestimating and underestimating wearers' heart rates. For most people, errors like these aren't a big deal, says Gillinov. But for elite athletes and cardiac patients who try to keep their heart rates in certain ranges, these devices might not be the best choice. "For those groups, I'd recommend medical-quality chest-strap monitors," says Gillinov, adding that he doesn't think that inaccurate heart rate monitors are dangerous, just that they might not be useful. Part of the problem is how they work, he explained. If you've ever been in a hospital, you might have had a little plastic clip attached to your big toe (or your ear, or your finger). Those are pulse oximeters — they measure heart rate and oxygen content by shining a light through your skin. Different amounts of light bounce back depending on how much blood is flowing. By measuring changes in reflected light, pulse oximeters can track how fast your heart is beating. Hospital pulse oximeters are wrong all the time. "We often have to move the monitors around because we lose the signal," says Gillinov. The heart rate monitors in Fitbits and Apple Watches work the same way, except they shine the light through your wrist. If you have dark skin, a tattoo or a birthmark where the monitor sits, Gillinov says that can confuse the monitor. This isn't the first time wrist-born heart rate monitors have been called inaccurate. A class-action lawsuit filed against Fitbit in early 2016 claimed just that. In a statement provided to NPR, Fitbit says that "Fitbit trackers are not intended to be medical devices" and that internal research shows that their trackers meet "industry standard expectations for optical heart rate on the wrist." But there are growing numbers of heart-monitoring apps that are intended to be used as medical devices, which unlike fitness trackers have to be approved by the FDA. Some are designed for home use, while others are for health care providers. Screening for atrial fibrillation has gotten a lot of attention, because this irregular heartbeat can cause blood clots, parts of which can break off and move to the brain, causing stroke. Patients with atrial fibrillation are five times more likely to have strokes, and it affects 9 percent of people over 65. It's possible to be experiencing atrial fibrillation and not know it. Since this condition can come and go, there's no guarantee that doctors will catch the errant heartbeats. Right now, the only way to detect it is with an electrocardiogram, or EKG, which involves visiting a medical professional and using a machine to monitor the heart's electric signals. One iPhone app, called Cardiio Rhythm, monitors the heart using a phone's camera. The concept is similar to a pulse oximeter or wrist wearable. Researchers used this phone-based device to detect atrial fibrillation. In a study published in July in the Journal of the American Heart Association, researchers used the app to screen a little over 1,000 patients for atrial fibrillation. They caught the erratic heartbeats in 92.9 percent of patients who had it, and correctly identified 97.7 percent of patients who didn't. That's not accurate enough to make a diagnosis, but it is accurate enough for widespread at-home screening, says Ben Freedman, deputy director of cardiovascular strategy at the Heart Research Institute in Sydney, in an editorial accompanying the study. The app could tell people if they were at risk, but confirmation would have to come from a doctor's office. Another device, called AliveCor, scans for atrial fibrillation using a small handheld EKG. The AliveCor EKG can connect to a smartphone and analyze heart rhythm. A study published Wednesday in Heart trained 13,122 participants to use the AliveCor EKG on themselves. Only 0.4 percent of their results could not be interpreted, and they caught 98 percent of atrial fibrillation cases in participants over 60. However, it had a high rate of false positives and only correctly identified 29.2 percent of those without atrial fibrillation. "Our study found that a significant number of citizens with previously undiagnosed atrial fibrillation were picked up by community screening," says Dr. Ngai-Yin Chan, a cardiologist at Princess Margaret Hospital in Hong Kong and the lead author on the study. People with atrial fibrillation can be prescribed blood thinners to reduce the risk of clots, and beta blockers or other medications to slow heart rate. "Whether this will be translated into people seeking medical help needs to be answered by future studies." A cardiologist and director of the Ahmanson-UCLA Cardiomyopathy Center, Dr. Gregg Fonarow, hopes that technologies like this will help identify atrial fibrillation early on and reduce the risk of stroke. "These applications can change the way cardiologists treat atrial fibrillation and prescribe better drug protocols," he told NPR via email. But we're not there yet. Gillinov, the author of the fitness-tracker accuracy study, deals with a lot of atrial fibrillation patients in his work as a cardiac surgeon. He thinks that self-screening could save a lot of lives, but that it's important doctors be included in the process. Plus, he says, not everyone should be screened for atrial fibrillation. "If young people start screening themselves, we're going to see a lot of false positives, even with very accurate devices." 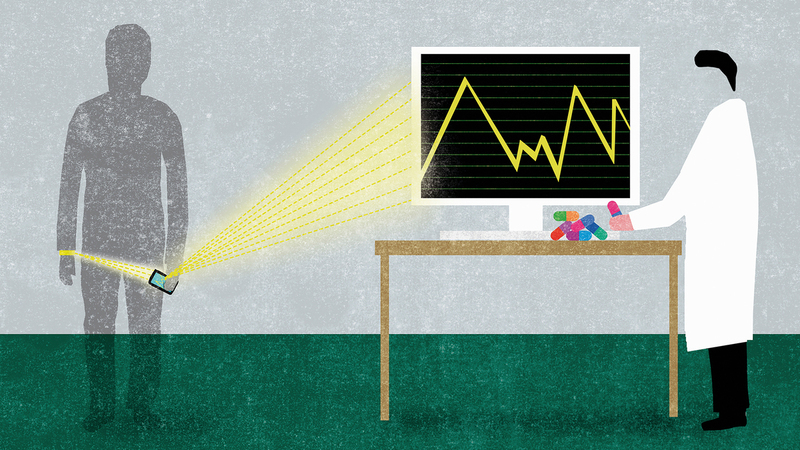 Sure You Can Track Your Health Data, But Can Your Doctor Use It? The American Heart Association plans to release a policy statement on telehealth, including at-home heart monitoring, sometime in the next six months. An earlier version of this story didn't make clear that fitness trackers monitor heart rate, while FDA-approved devices monitor heart rhythm.